Detective work by Weatherspoon Art Museum staff helped an artist confirm the deal of a lifetime from a local Goodwill store. Artist Beth Feeback, always on the look for large canvases to repurpose at thrift stores, though she’d hit the jackpot when she bought two huge paintings for a mere $9.99 each. 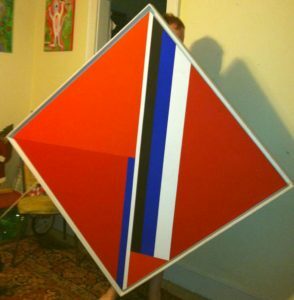 Did she ever: One of the large square canvases was painted by noted Russian abstract artist Ilya Bolotowsky and had a Weatherspoon Art Museum sticker on the back. Someone contacted the museum staff. Could anyone help figure out how such a valuable painting ended up at Goodwill? Read the full story on the Weatherspoon Art Museum website.